Considering gaming as the main use case for my passthrough setup I try to minimize the latency on the guest (don’t bother, straight to the config). One knob to turn in order to squeeze out more snappiness is CPU-pinning. This will allocate CPU-cores for mainly (or solely) Guest tasks, when the Guest is running. One could go one even further and restrict access to the guest cores completely, even if the guest isn’t running. This would use the isolcpus kernel command line flag at boot time. I do not use this feature as I would like to have maximum Host performance if the Guest is not running. I started with benchmarking several setups (found on level1tech, reddit and the arch wiki) – used cinebench, superpossition etc… In the end the results were, unfortunately, not as meaningful as I have hoped. Sure, more cores lead to better CPU bench results, but in terms of pure FPS performance the results were not significantly different. Thus I went with common sense. The AMD Ryzen architecture houses 8 physical cores, each core capable of handling two threads. This leads to a total of 16 cores available for pinning. 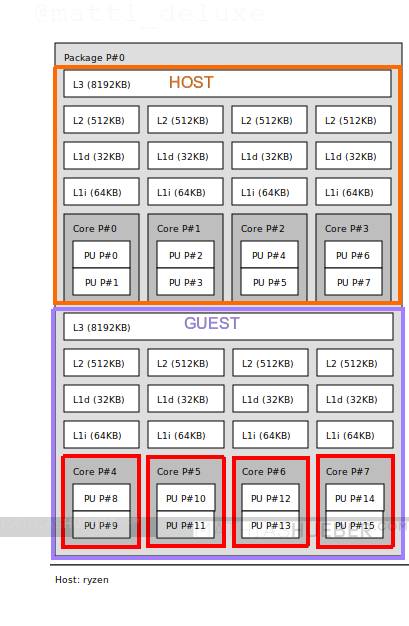 The 8 cores are separated into two complexes of 4 cores called CCX. 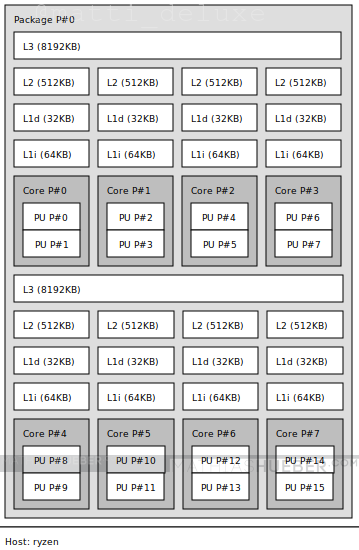 Each CCX has its own L3 cache. The plan is to have one CCX for the host, and one CCX for the guest. As the hosts runs first, ill assume it will use the (first) CCX with cores 0-3. The second CCX (cores 4-7) shall be used for the virtual machine. I used a 12 pin setup to the Guest (6 cores) for half a year. Somtimes I encountered micro lag-spikes, which I was unable to track down the source of it. Attention:Make sure <vcpu>, <iothreads> and <cputune> have the same indent. Attention:Make sure <hyperv>and <acpi> have the same indent. Thanks for great configuration. Just bought Ryzen 2700 due to similar reasons – I had problems with guest latency, hope extra cores solve this issue. Let me know if it helps, I am always looking for further tweaking suggestions.